You probably don’t care that someone is trying to build a better digital photo frame, but your non tech-savvy grandparents might. That’s what prompted a startup called Timewyse to come up with Pigeon, a Wi-Fi enabled digital picture frame that stays updated with fresh photos and videos that you and your family upload to the cloud. Timewyse is looking to raise $50,000 on Kickstarter. The startup’s primary selling point is that Pigeon is a better digital frame than the one you gifted your mom and pop a decade ago, both because it’s simpler to set up and easier to keep up to date. All the recipient needs to do is enter their home network’s Wi-Fi password; or you can do it for them since it only needs to be entered once. After that, the onus falls on the gift giver to push updated content to the frame. Up to 10 people can send photos and videos to Pigeon. This is accomplished by selecting a photo from your phone’s camera roll and sending it to the accompanying Pigeon app, which is available for Android and iOS. Your photo is then uploaded to Pigeon’s encrypted cloud and automatically sent to one or more desired frames. The upshot is that Nana can now enjoy new content on her digital frame’s 10-inch display without having to figure out how to update it herself. 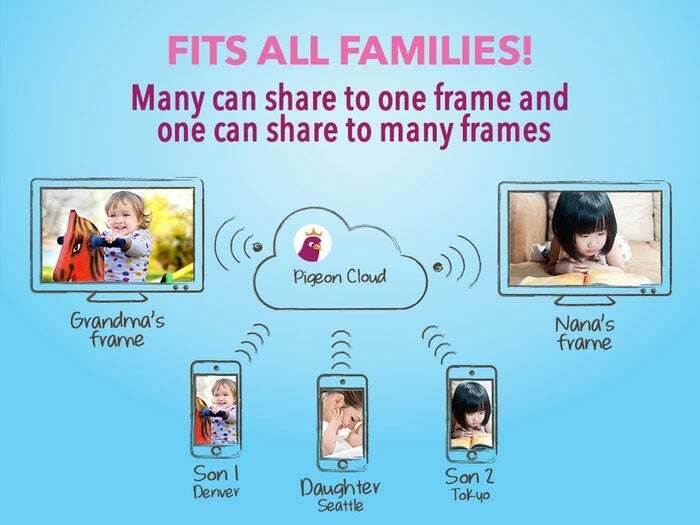 You and your siblings can each push photos and videos to multiple digital frames. Each Pigeon frame comes with a hook and a magnetic back so recipients have the option of hanging it on the wall or slapping it on the refrigerator. It also has a motion sensor to prevent it from running all the time and prematurely draining the rechargeable battery. When there’s new content to view, a green LED will blink. Finally, a pair of 2-watt speakers gives the Pigeon audio capabilities, so little Billy can verbally thank his grandparents for his birthday money. Timewyse president Keith Beckley explains that he has experience building complex and intricate products and knows what to expect on the manufacturing side. Armed with that knowledge, the funds raised through Kickstarter will be used to source the necessary components, make refinements, purchase molds, and finish the software enhancements as Pigeon graduates from prototype to a finished product. While it’s not yet ready to ship, the good news for anyone interested in Pigeon is that the Kickstarter campaign can help take some of the sting out of the price tag. At the $119 reward tier, you’ll receive the entry-level “Winkie” Pigeon frame valued at $159; at the $135 reward level, you can choose from one of five customized frames valued at $184 each. There’s also a “White Vision” Pigeon frame available at the $180 tier that’s valued at $205. Why this matters: Enter “worst tech gift ideas” into your search engine of choice, and you’ll find “digital photo frame” near the top of many of them. They’ve become the fruitcake of the tech world, but those criticisms typically don’t take the gift recipient into account. Tech-savvy folks know all kinds of ways to share and display their favorite photos. Pigeon isn’t aimed at us; it’s targeting those of our relatives who don’t have the same grasp on technology. Like the GrandPad tablet for seniors that we told you about earlier, Pigeon might be a better alternative to teaching someone how to use email, download files, and edit photos. At the same time, Timewyse must be conscious of privacy and security concerns. We recently wrote about a cybersecurity report on connected homes being easy targets for hackers, and something like this could be yet another device to exploit. An ornery hacker could infiltrate Pigeon’s infrastructure and push inappropriate photos and videos to Nana’s frame. If someone isn’t already handling it, a tech-savvy (and hopefully local) family member should volunteer to periodically insure that Nana’s router has up-to-date firmware and secure passwords. 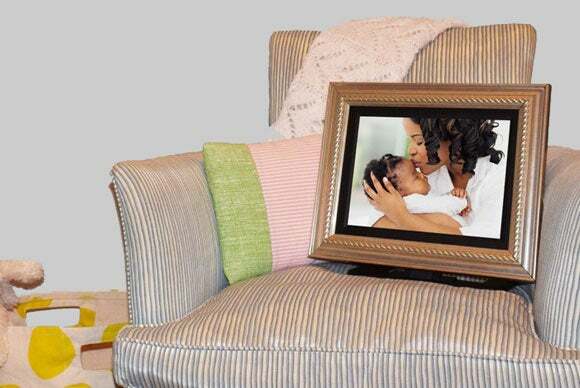 This story, "The digital picture frame refuses to die (and here’s one that wants to hatch)" was originally published by TechHive.